We stayed at a recommended hotel, The Electra, just off Constitution Square. It was an older, small hotel with a tiny, open-caged elevator, which slowly creaked us up to our fourth-floor room. But it had the ancient charm of the European places, and, best of all, our room was in the front and had a window that looked out onto Hermou Street, allowing us a view of Constitution Square itself. That famous square was located almost in the center of the city and was a landscaped and cement area in front of the Parliament Building, other hotels, shops, and sidewalk cafes. During the three beautiful, sunny days we spent in Athens, we started and ended our days on that square, enjoying espresso while watching people of all nationalities walking past, or the skirted, uniformed guards marching up and down in front of the Parliament Building. We walked to the Plaka, an area of clubs, restaurants, and shops, where we picked up most of our souvenir Greek vases, plates and statues. 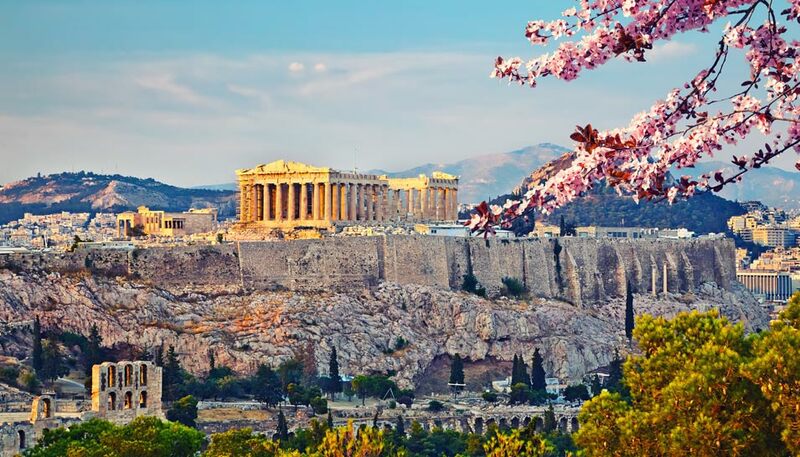 Another day we climbed the high, steep, rocky hill to see the ancient Parthenon ruins, and enjoyed a magnificent view of the city of Athens spread out just below. It was the most impressive foreign antiquity I ever saw. We also went on a tour to their museum to learn more of the Greek history and enjoyed espresso in a beautifully landscaped garden in front of it. The last day there, we were treated to a most unusual sight, a Greek Orthodox Church Easter Parade, complete with robed and habited priests and nuns, bearing huge crosses. They passed just below our hotel window on their way up to Constitution Square. All in all, I couldn't have asked for a more perfect first visit to Athens. The next day, April 29th, 1978, we flew on to London, England, but found an entirely different cold and rainy climate. That was our first trip there as well, and I had been looking forward to seeing the homeland of so many of the guys I had worked with in Community Maintenance. They had told me about places to go and things to see, but we ended up spending most of the first day in the hotel because of the rain. The second day it let up just enough for us to be able to get out a bit, so we walked across the park in front of our hotel, and just happened to catch the changing of the guard in front of Buckingham Palace. Then we managed to see Westminster Abbey, Big Ben Tower and clock, the Thames River, Trafalgar Square, and a bit of Soho. It continued to rain, which was disappointing but instrumental in making us decide to cut our visit short. So, on Monday, May 1st, 1978, we caught the new, non-stop Braniff flight from Gatwick Airport directly to Dallas. For the next month, we enjoyed seeing and visiting with Vicky and Keith and various family and friends in and around Richardson, Texas. Oran checked into a few job and business opportunities, and I did a little bit of shopping, just in case. Then Oran informed me that he had definitely decided to resign almost as soon as we returned to Arabia. I guess I kind of panicked and got this idea that I should go back to Arabia right then, ahead of him, to start getting organized to leave for good. To my surprise, he agreed.